The first day of our bicycle trip involved traveling the previous day to Las Vegas, and then a shuttle to St. George where the next day I met up with CyclingEscapes and a few other folks. I then got to pick out my bike since I was renting and I loved it for the next 7 days. 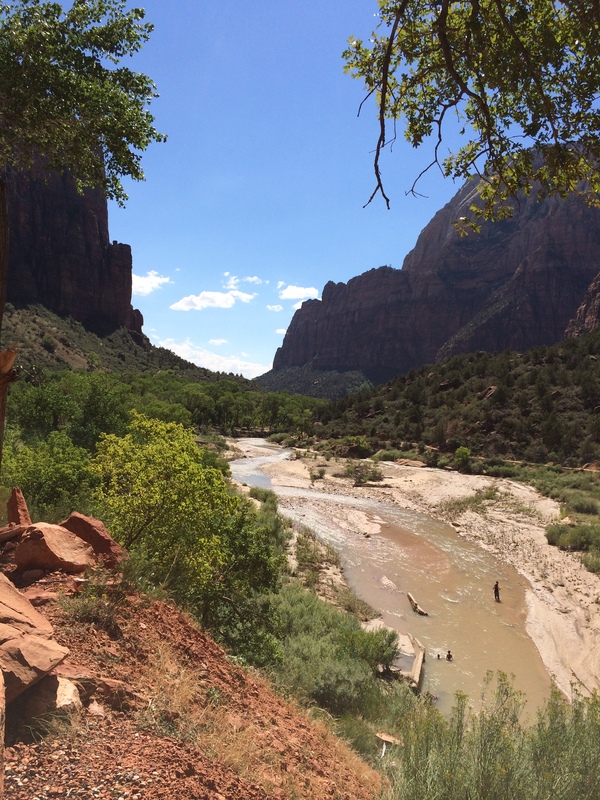 We then drove to Springdale where we met the rest of the squad and after orientation we did our Zion valley floor shake out. We loved the scenery and and the lack of cars on most of the valley floor. (Click to see any picture is its full glory). We already anticipated the day knowing that it started with a series of switchbacks as we rose out of the valley floor to the infamous tunnel through the Eastern wall of Zion (we had to take the van for that section). 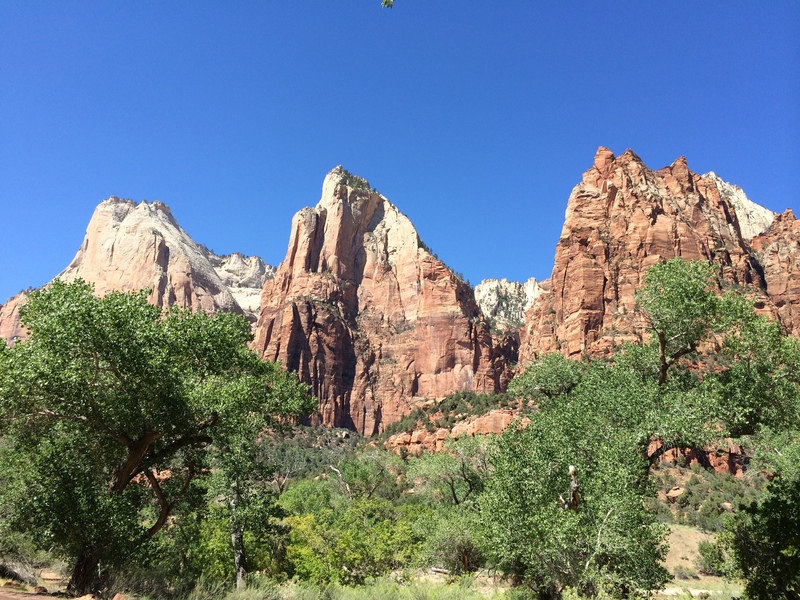 After that we saw the beautiful and remote eastern side of Zion. This was the beginning of the longest ride of the week. Wide open spaces, very few cars and the gradual and sometimes not so gradual rise to the top of Bryce Canyon. I had visited here over 20 years ago and I was really looking forward to the sunset over the canyon. Since we had 13 or so people on the tour of various abilities (I was somewhere in the middle) we were spread out over probably 10 miles by the end. Sometimes you were riding by yourself for many miles and sometimes you had 2-3 fellow bicyclers with you. Normally recover rides are short rides after a big race or ride. Typically they do not involve a whole lot of climbing are are meant to get the blood flowing through the muscles. With all the downhill my speed was very high for me and I really enjoyed the long downhills. There was not much time for pictures, but we did take a hike into Bryce Canyon in the morning to let it warm up as we were nearly 8000 ft in elevation. The weather on our entire week was spectacular with no rain except for a few drops on one mountain pass. Where we were going, east, there was not much in the way of big towns, certainly no Starbucks, so getting to Escalante and a great cafe was indeed a highlight. We stayed in the best hotels and ate at the best restaurants a two hotel town could offer :-). Today was the day we were all anticipating. Hearing so much about the wide open vistas and the 4000 ft climb over a major mountain with an elevation over 9000 feet got our attention. Today was the big climbing at high elevation day. The schedule of the day typically starts with meeting at 7am at the restaurant where our sometimes noisy sometimes quiet group pigs out on all the eggs, pancakes and pseudo-coffee one can endure. We then get our gear ready and start rolling at 8am. It took me a few days to realize that there was a cooler of cold beer available at the end of the ride. After the post-ride celebrations we were on our own for recovery before dinner at 6pm. Rolling into the hotel, the best Best Western, was like a dream come true after today’s ride. The accommodations were complete with hot tub and pool with great views. I was in the mood for poolside cocktails and I broke out the good scotch I had acquired in Las Vegas for a plastic cup soiree at the pool. People ask me if biking every day for many miles and significant climbs is hard. There was a 4-6 week training period on top of my normal biking week. 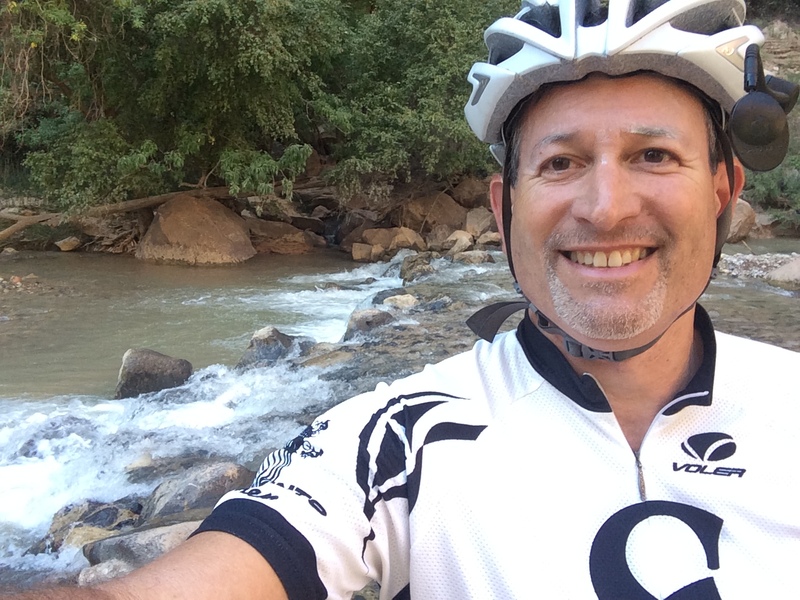 Mostly the focus is time in the saddle with a moderate amount of climbing. With the elevation we were at, I noticed at first that the oxygen was limiting; my muscles were fine, but not enough oxygen to keep the muscles moving at the rate they wanted to. Each day it got easier as we adjusted to the elevation. Day 5 was my favorite day and Capitol Reef is indeed spectacular from many points of view: history, beautiful scenery, Native American ancient alien rock art, and a view in the desolation just north of Lake Powell. Today we had the choice of a scenic road through the center of the Reef (which is actually a fault zone) or going on a hike, and I chose the scenic road which was well worth it. Today we began the journey west towards where we started. We went to a town called Boulder and our plan was to ride the Burr trail, an amazing slot canyon. 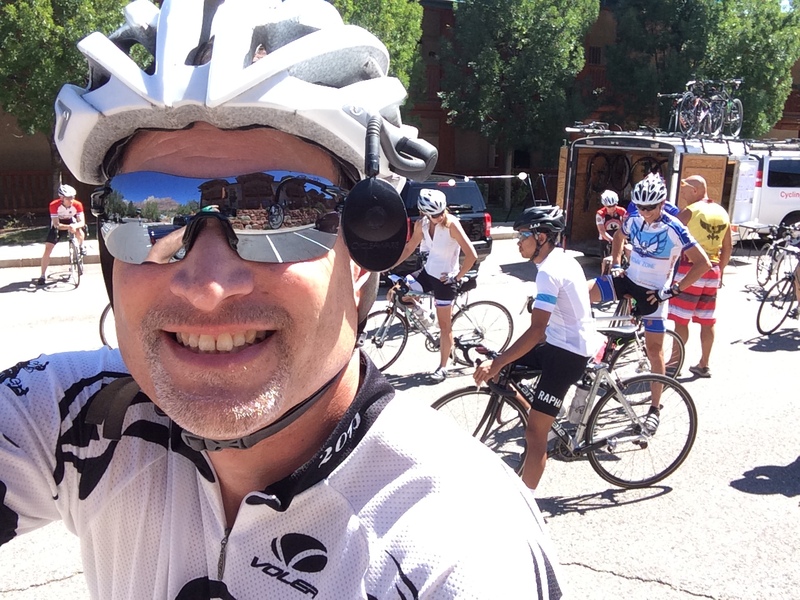 It has spectacular scenery and as I was riding out of the Canyon when I heard what every biker dreads to hear (having heard this once before on a century ride I know what had happened). A big gust of air in my face and I realized that my tire (not tube) had blown out. This does happen occasionally. 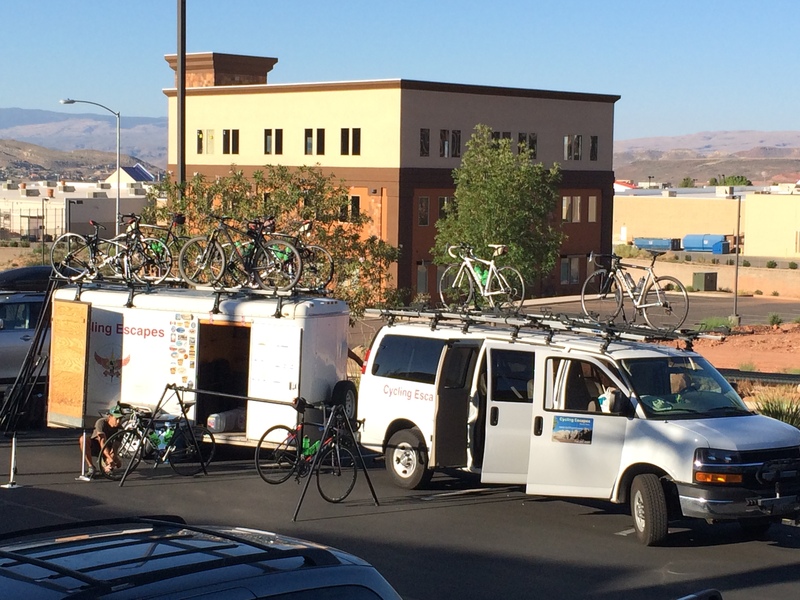 The tour I was on always has a rider or a sweep van making sure everyone is doing well, hydrated and can get through a mechanical. This time I was biking back with our guide Adam Masters who is actually quite famous. We were in a slight pickle. The van with the spare tire had moved on ahead to collect the squad and link up with bikers who were doing some other riding routes that day and Adam told me that he would ride out and bring a van back for me. My ride was over for the day, 10+ miles out from the main road. He told me to sit under a tree and he would be back in 75 minutes or so. Heck no, I was here to see the world so I started walking out with my bike on my covered cleats. I made about 3 miles and actually really enjoyed seeing nature from an even slower pace. Definitely a day to remember. We drove back to Bryce where stayed in somewhat lower accommodations than at the national park, enjoyed dinner on our own and I captured the fiery red sunset of my twitter feed background. 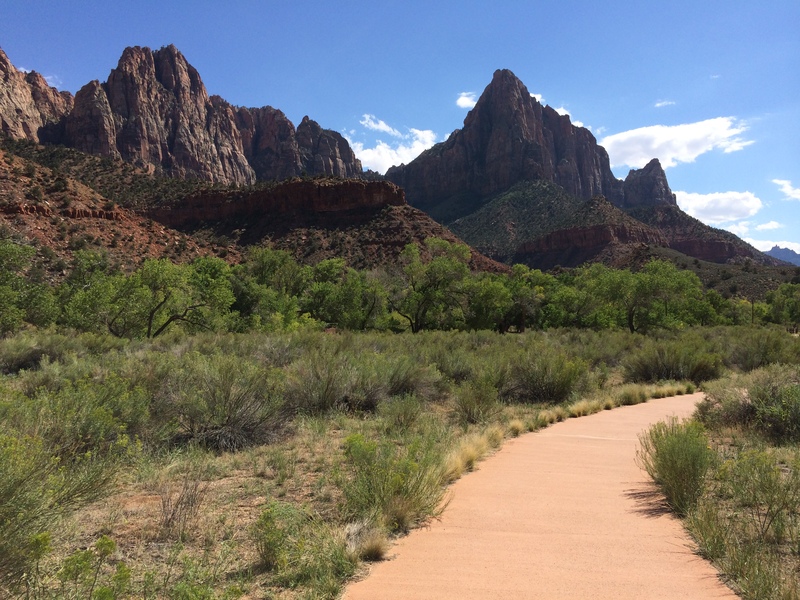 Our final day arrived and it was a shorter ride along the Rim trail, something I had not seen in previous travels. A great ride for the day, and then the bittersweet van ride back to St. George for departure. Definitely a ride of a lifetime. Again making it almost to 9000 ft. meant lots of abundant sun (and sunscreen). The picture with the squad was us waiting for our guide with the permit to enter Bryce. 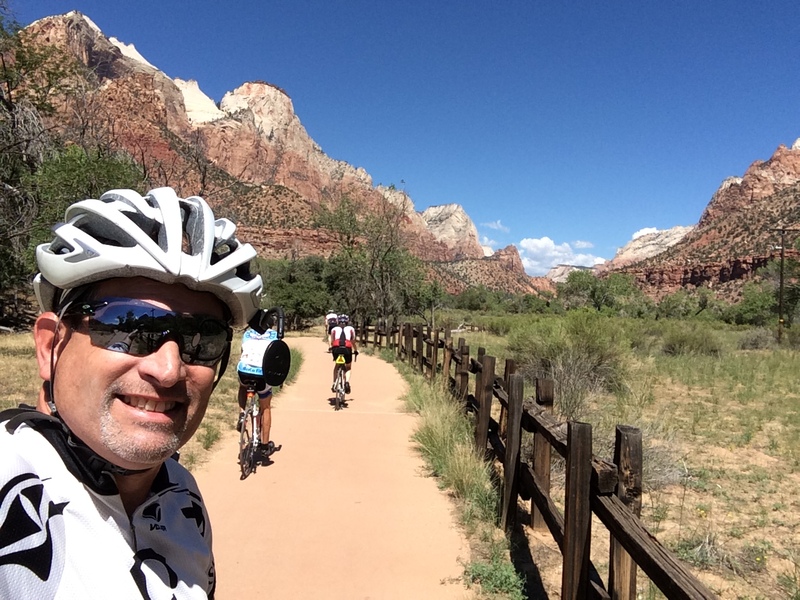 I hope you enjoyed the insider view of my Utah bike trip. As I take on other trips I will update this section of the site, with potentially a daily blog during the trip.